Monster Monday: The biggest pizza in the world is ginormous! In our latest installment of weekday series, we introduce Monster Mondays. This series about big things. Especially big food. Really big food. Here is the biggest pizza in the world! 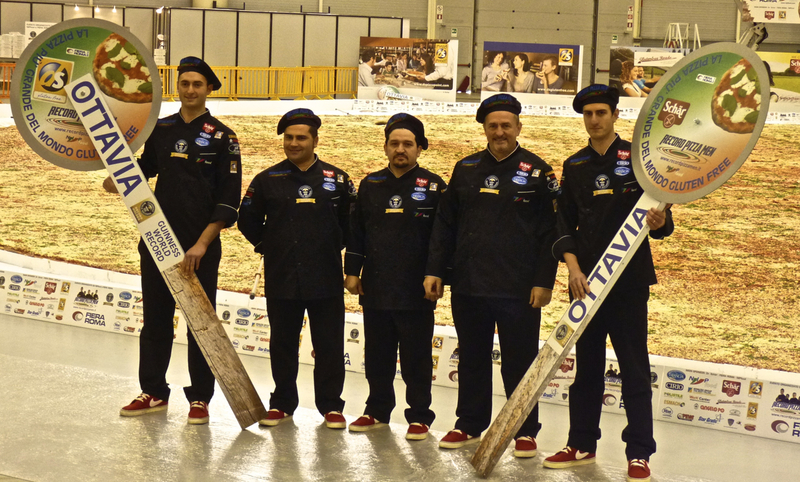 The largest pizza has a total surface area of 1,261.65 m² (13,580.23 ft²) and was prepared by Dovilio Nardi, Andrea Mannocchi, Marco Nardi, Matteo Nardi and Matteo Giannotte (all Italy) from NIPfood at Fiera Roma, in Rome, Italy, on 13 December 2012. The pizza was named “Ottavia”, a word of Roman origin for “eighth son”, as a homage to the first Roman emperor Octavian Augustus, who represented an epoch-making change in the history of Rome and brought the Empire into a period of economic and cultural unrest. Ottavia was 100% gluten-free, educating and spreading a message to the whole world about the importance of health conscious food choices. A gluten-free diet can have a variety of health benefits, including improving cholesterol levels, promoting digestive health, and increasing energy levels. You can’t order this pizza via Hungr, but we have lots of other great pizzas!